Following our morning Orthros, led by Fr. 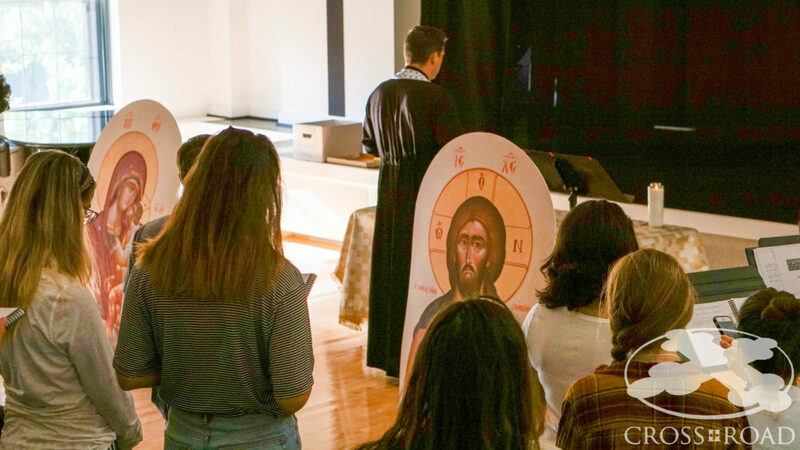 Kosmas Kallis from SS Peter & Paul Chicago, CrossRoaders were introduced to “Be Still Time”–a time that the participants take for their own personal prayer and reflection to clear their minds and focus on the day to come. We then headed to breakfast and fueled up for a full day of sessions and learning about our vocations and unpacking the question “Who Am I?”. We learned about the Sanctification of Creation and how there is love and life in God’s creation. North Park’s beautiful campus gave us the perfect space to discuss that idea. This was a closely connected lead-in to our lecture on Orthodox Anthropology. We reflected on our identities and the pressures from society to live up to certain expectations. The CrossRoaders ultimately saw that their most important identity is that we are all made in the image and likeness of Christ. Succeeding the the lectures, we took a tour and heard a talk at St. Gregorios Indian Orthodox Church. Yesterday evening Dn. Perry Hamalis from Holy Apostles Church in Westchester, IL, spoke to us about Vocation and Missions and his calling to engage in this type of work. He described short-term and long-term missions, including his own experience by working closely with the Orthodox Church and communities in Korea. The participants are engaged with the content as well as growing closer as a group. The laughter in the cafeteria and on the bus is such a joyful sound to hear! Please continue to keep us all in your prayers.